Music Connect can be a great help in keeping track of the albums you own or plan to buy. 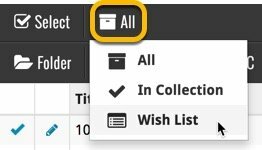 Using the “Collection Status” field for each of your albums you can track if an album is in your collection, or on your wish list. You can filter your albums based on what their collection status is. So you can pick to see all your albums, just the ones that are in collection, or just the ones that are on your wish list. *If you try to add an album that is already on your wish list, Music Connect will ask you if you want to “move” the album to your “Collection”. This changes the collection status for your existing album! To change the collection status of an album you have to edit it: Click the edit pencil for an album to open the Edit Album screen. Change the Collection Status at the bottom of the Edit Album screen.